My wife was looking for a new phone and just before Christmas, I suggested her to go for a OnePlus One phone. At that time, they were offering the phone without the invite and promising delivery before Christmas. As luck would have it, by the time she made up her mind, it went back to requiring an invite. But my eagle-eyed pal Amit Panchal spotted a slot where it came back to open sale and alerted me. This time, we didn’t falter and ordered the Sandstone 64 GB model immediately. It took about ten days to ship but arrived before Christmas as promised. Here is a “user” review of the phone, after my wife has spent a few weeks with it. 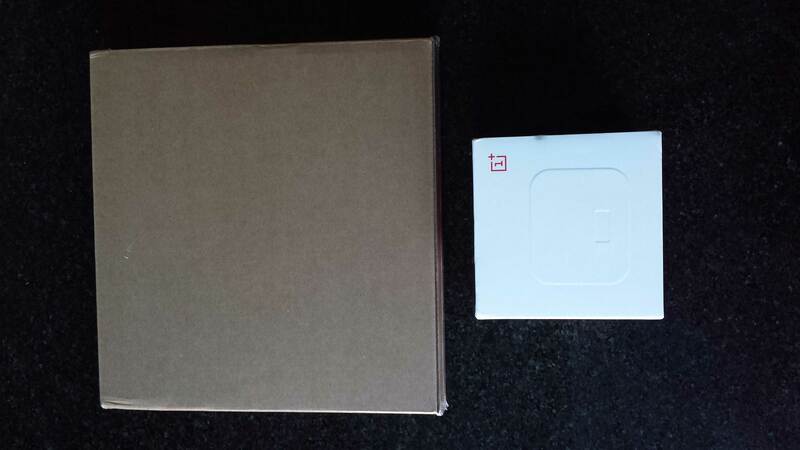 The package contains two items: The box for the phone itself and the charger packaged separately. Opening the phone box reveals the phone. 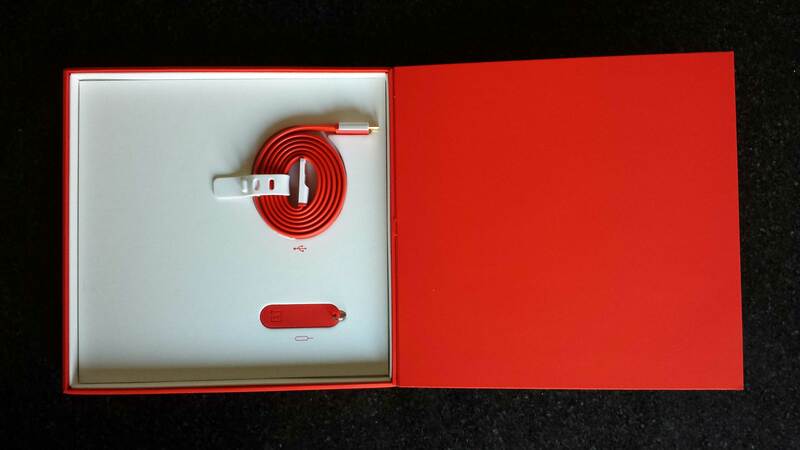 Underneath the phone, is the lower panel of the box containing a data cable and a SIM slot tool. This tool is similar to the one offered by iPhone and works exactly like that as this phone also has a similar slot. The phone’s back feels like felt but seems much tougher than that and gives a satisfying grip. That’s great as most new generation phones, give you the worry that they might fly away from your hands any second. No such worries with this one! The first thing I always do to a new phone is to give it a proper charge using its own adapter. This was no different and even though it said it was 62% charged, I still gave it a good couple of hours, to ensure it was fully charged. Immediately after switching on, it went to the CyanogenMod Welcome Screen and asked for Language/Country, WiFi details and if we want to go through the Google Account setup. We linked it up with my wife’s Google account and after that, it was just a matter of a few more questions relating to CyanogenMod account setup, personalisation, Date/Timezone etc. Within a couple of minutes, we were at the home screen. While that was happening, the phone had already started searching for updates and soon after reaching the home screen, it asked if we wanted to apply the update. It was applied but a couple of more came later. It finally settled on CyanogenMod 11.0-XNPH44S, which is based on Android 4.4.4.
and tick the relevant boxes to enable Gmail Contacts and Calendar information to sync with the phone. Once that was done, everything sync’d perfectly. Given specifications of the phone and that fact that it runs CyanogenMod (which means no vendor junk), I didn’t have any worries about the performance of the phone but after a few weeks’ usage, my wife is perfectly satisfied with the phone. Videos run and look great too but you may have to adjust the screen brightness to meet your preference. Applications open without delay and everything runs without any stutter or delay. Battery is concealed so there was a worry that it might become an issue if it doesn’t last long enough. Again, the fact that the phone runs CyanogenMod meant that I was hopeful that it will last at least a day. Those worries quickly evaporated once the phone was run for a few days. It typically lasts about two days on a single charge. Now my wife’s phone usage patterns are quite different to mine but definitely not light. As a reference, she has a Facebook account, two Twitter accounts and six mailboxes sync’ing with the phone all the time (highest sync’ing frequency selected for everything – all hours). She checks her phone for updates every half hour, goes through whatever is important and does some occasional browsing. WiFi and Bluetooth are also always on. I’ve also noticed that it only loses about 5% battery overnight which isn’t much. With that kind of usage, I think two days worth of battery life is mind-blowingly brilliant! There is a decent camera on the phone and will cater for all your typical needs. Selfies are also better as there is a 5 Megapixel front camera. However, I wasn’t quite satisfied with the picture quality. Maybe the camera settings need a bit of tweaking but I didn’t get a chance to experiment with that. It’s my wife’s phone anyway! Also, I felt picture taking is also a little sluggish but then I didn’t take enough pictures to be able to properly justify this comment. Pretty much all phones come with features that the vendor thinks are important to us. Some can be removed but for most, you don’t get a choice. It doesn’t matter if they’re important to you or not, they’re there and a drain on your phone’s battery. Running CyanogenMod, means there are no such apps on the phone. For some this could be a bad thing but I’ve always used the apps I want to install and not the ones that come natively installed by the vendor. If you’re also the kind that don’t like or use vendor-provided apps, this phone could be ideal for you. I haven’t tried it so far but I am sure, there won’t be anything stopping me from hacking this phone when I want to. You will have to enable “Developer Options” on the phone to start as the option is hidden by default (Tip: Tap “Build Number” 7 times under “About Phone” and then return to “Settings”). The whole idea behind CyanogenMod is to be able to do what you want on the phone, remove the stuff you don’t need and do what you see fit. Of course, you don’t have to do it and still be happy with it but I like it to be available to me, should I wish to play with it. :-). 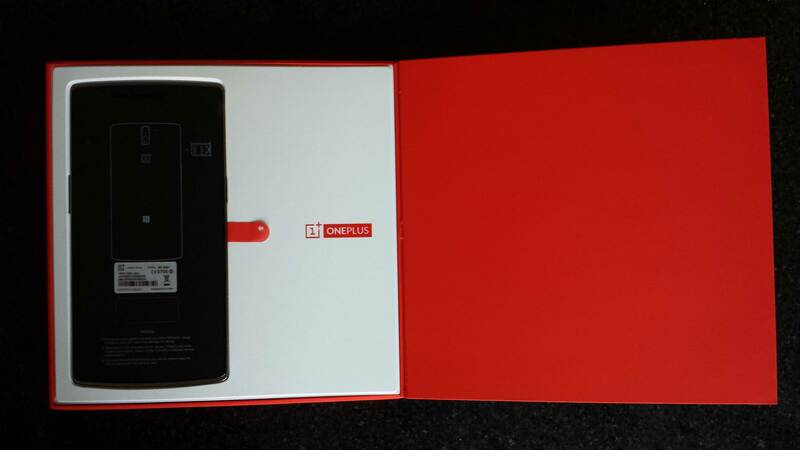 For more details, go to the CyanogenMod Development page for OnePlus One. The fact that the battery is sealed does mean that the phone will become useless once the battery dies (or doesn’t last long enough) but I think the longer battery life I’ve seen so far, should translate into low recharge cycle rate, giving the battery a longer useful life. At the end of the day, the phone is less than half the price of major phones these days of a similar specification so in the worst case scenario, another one could be bought. There is no SD-card slot. That was the reason why we chose a 64 GB model. That said, we’ve never ever even come close to half of that so I don’t thing storage expandability is an issue. If you do need more than that then maybe this phone is not for you. A possible issue might be LTE connectivity, depending on where you are and/or your carrier. A review here mentions the issue in that only two carriers here in the UK can support 4G on this phone (EE and Three) due to a missing band. For my wife and I, it’s not an issue as we’re with EE but do check, in case it’s applicable to you too. The vendor is new and unknown so they could disappear, leaving you with an unsupported phone. That fear could be strengthened by the fact that the price is quite cheap and so the margin might be small, making sustainability a problem. However, the latter point could be reversed into thinking that a cheap but well-designed/spec’d phone will sell in volume, therefore strengthening the company. Given the popularity so far and price point, this seems like a risk not worrying about.